No. 9 KCKCC women win pair, but tough tests are ahead – Welcome to Wyandotte Daily! Safely through an exhausting challenge that included two games and a four-hour bus ride in a span of 37 hours, the road suddenly gets much tougher for Kansas City Kansas Community College’s No. 9 ranked women’s basketball team. Coming off a 92-50 win over William Penn JV Sunday in Oskaloosa, Iowa, and an 86-56 home court win Monday over Washburn junior varsity, the Lady Blue Devils take on St. Louis Community College Friday at 6 p.m. and North Central Missouri Saturday at 4 p.m. in the annual Keith Lindsey Classic. And then go to perennial power Des Moines Area Community College next Tuesday. Balanced scoring with different leaders highlighted the wins over William Penn and Washburn. Because of injuries and team suspensions, eight players have carried the entire offensive load with each of eight scoring at least seven points in each game with one exception. Sophomore Nija Collier led the way at William Penn with a game high double-double 21 points and 14 rebounds while front line teammates Lillie Moore added 18 points and 6 rebounds and Kisi Young 11 points and 9 rebounds. 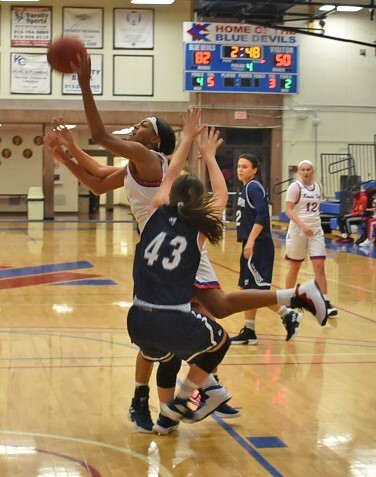 “Nija Collier gave us a huge boost off the bench,” KCKCC coach Joe McKinstry said. “Her energy was something we needed and it’s certainly helpful when she’s making shots from the 3-point line (4-of-7). The trio of Nija, Lillie Moore and Kisi Young definitely stood out statistically as they have most of their time here at KCKCC. It’s hard for teams to prepare for all three of them. Caroline Hoppock added 10 points and Camryn Swanson and Brodi Byrd each had nine, all on 3-pointers. Lexy Watts and Lenaejha Evans had seven points apiece and led in assists with four each. It was the outside shooters who led the way against Washburn Monday. 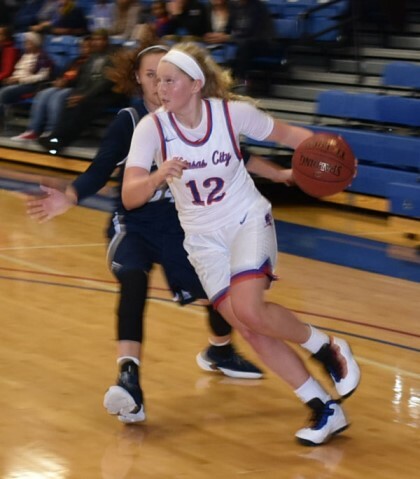 Boyd and Swanson each had four 3-pointers and it was their five field goals from the perimeter that got KCKCC in front to stay 26-15. Brodi finished with 17 points and Swanson with 14 while Moore and Collier dominated inside. Moore had 17 points and 8 rebounds, Collier 8 points and 12 rebounds. Hoppock and Watts added 9 points each and Young 8 in another well balanced attack. With two games this weekend, three in five days and eight contests remaining in November (four on the road), the Blue Devils’ national ranking will be severely tested.